Two avocados sat in a concrete bowl on the marble counter on their way out, supple amidst the stones. I was home alone, and the whole day had passed with hardly a moment to spare. The sun was still up but on its way out too. My husband would be home soon. The avocados, they wouldn’t survive another day. By morning rot would settle in but right then, right then they were perfect. Most perfect right before they spoiled. Seems like it must be a metaphor for something or other. Forget it. The emails and external hard drives could wait. I needed to make soup. Cold soup because summer doesn’t care that it’s September. With a few flicks of the vitamix switch, it was done. There’s no cooking involved. I stirred a few ice cubes through it. I like my cold soup cold. Sprinkled on mint, pepitas, and goat cheese. Drizzled a bit more oil and cream. Finishing salt. Done. 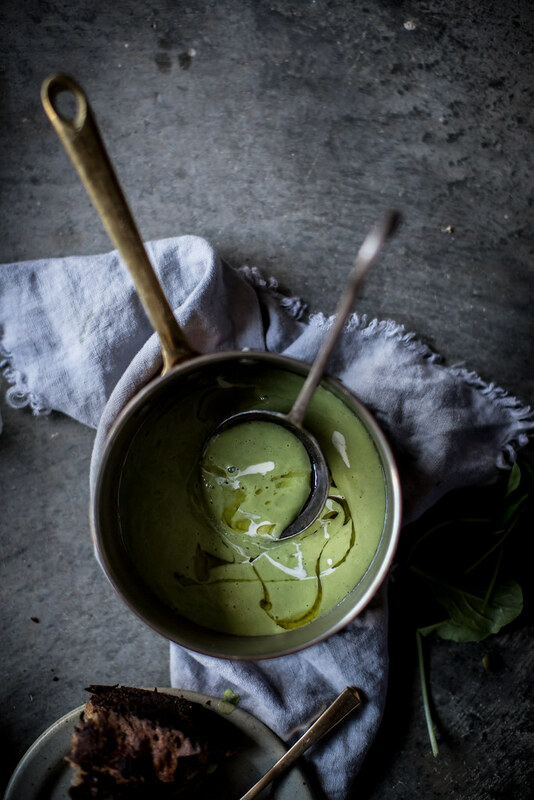 It was creamy and tangy and herbacious and so green and cool. Everything I’d hoped it would be. When he came home, I poured him a bowl. Hit it with the pepitas, shredded a few mint leaves with my fingers. Tore a piece of bread off and put it on the side. He loved it, and that was even better than the first bite. Here’s the recipe. ps. Want it dairy free? Sub a non-dairy milk like coconut or almond for the cream. It won’t be the same, but it will be different and good and lighter. This recipe does well in a vitamix. If you have one, bust it out. If you don't, a regular blender will do. I might strain it if I was using a regular blender as I think the smooth texture is essential here. 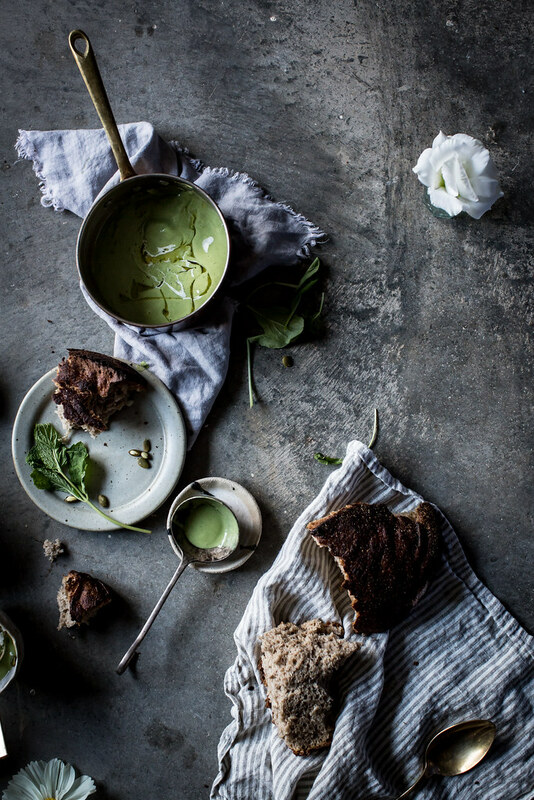 Garnish options are endless but my favorites for this soup are as follows: olive oil, cream, fresh mint and/or chives, chevre, toasted pepitas (love the tamari ones), and toasted or grilled bread on the side. Either that or spicy bread crumbs on top. Place all ingredients in a blender. Blend until completely smooth and no bits remain. Adjust lemon, salt, honey, and water to taste if you want to. Either chill until very cold or stir a handful of ice through it until cold. Ladle into bowls and top with the garnishes of your choice. I highly recommend a bit of finishing salt on top & crusty bread alongside at the very least. I, on the other hand, like my soup hot. Been cooking up soups like a mad woman and they have been flying off my fridge like crazy, ever since I came back from my vacation. 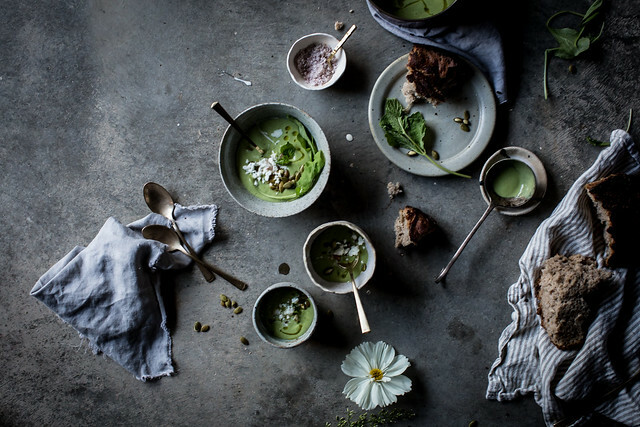 I also do not like the taste or texture of avocados – unless they’re part of a really well seasoned guacamole that I can eat with corn chips – and yet, the images convey such warmth, such homeliness (spelling is wrong, I bet!! ), such cozyness, I feel I could down a bowl of this soup. Also, portuguese olive oil. Come on, we do have the best olive oil in the whole wide world, don’t we?? 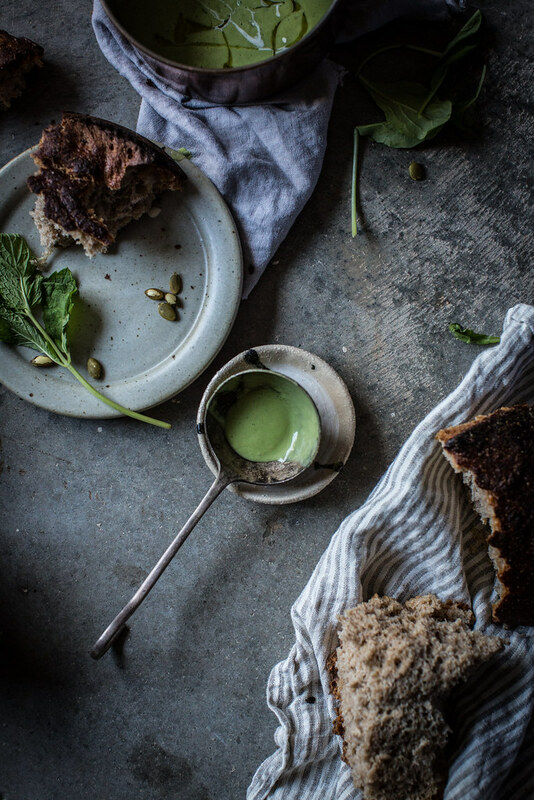 Hmmm… I can almost smell the scents of cool mint, with a hint of goat cheese and a hearty sourdough loaf. 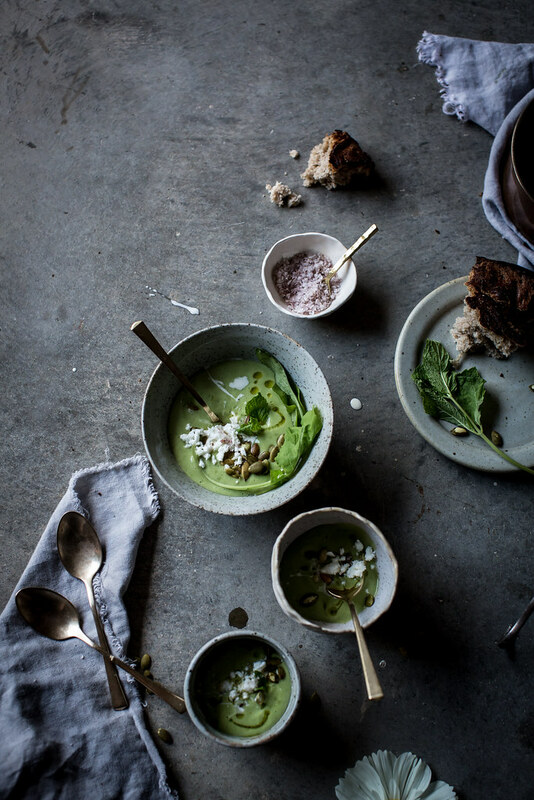 As it’s getting cooler ’round here warm soups are what I’ve been craving lately yet I think with a fresh warm bread I could get used to yours – might even turn into a cold soup lover, because whats better then having avocado by the spoonful! 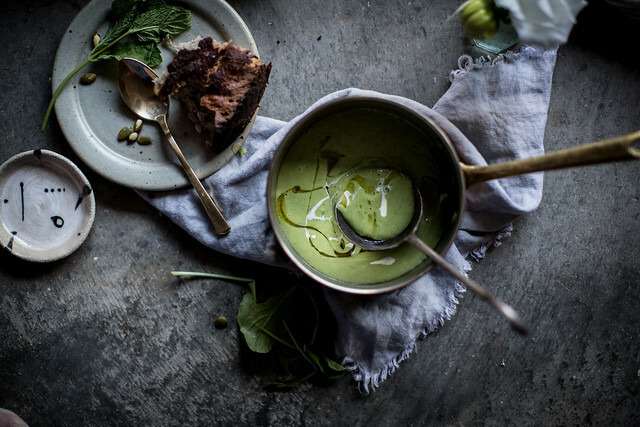 This sounds like such a perfect combination, the creamy avocados and the strong flavour of arugula. I would never think of putting those two together. And the goat cheese, I love goat cheese, I could eat it with everything – sweet, sour, you name it goat cheese can be there. This recipe is going to materialize something good in my kitchen. Thank you! A well-timed recipe. Our avocado tree produced a bumper crop. There’s a giant basket of them on my counter right now. Inevitably, they will all ripen on the same day, and I will make this creamy cold soup. 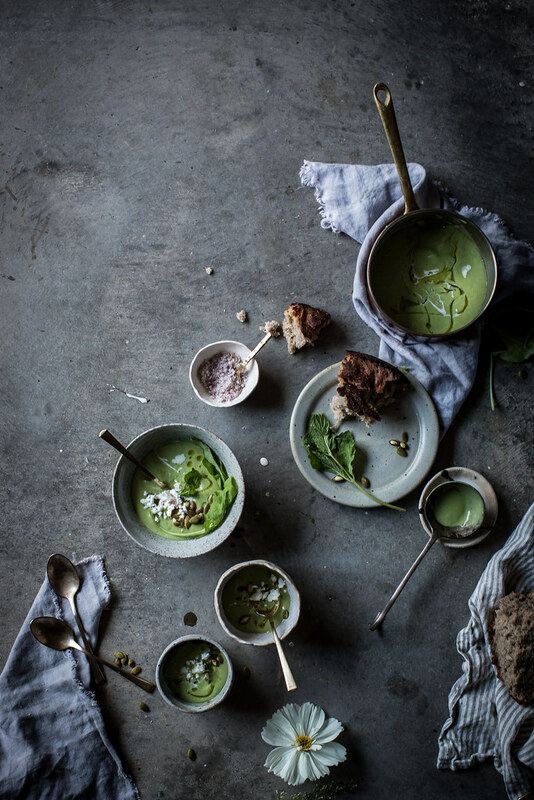 I love it all…food …photography….writing…as always. Sumer is not gone yet here in Madrid . Temperatures of 130ºF are the norm. I ´ll stick with cold cuts sandwichs like BLT or Philly Steak, lunch or dinner. I won´t turn the burners or the oven on. Crazy weather: probably in three weeks we get snow! You inspired me to mix seasons. I made this, this evening, with turmeric roasted root veggies. An odd mix, but it was surprisingly good – and appropriate because of the seasonal cusp. And for anyone’s information, my Kitchenaid blender worked wonderfully for this. Why is it that all your recipes look like amazing artworks and mine always turn out so dull? 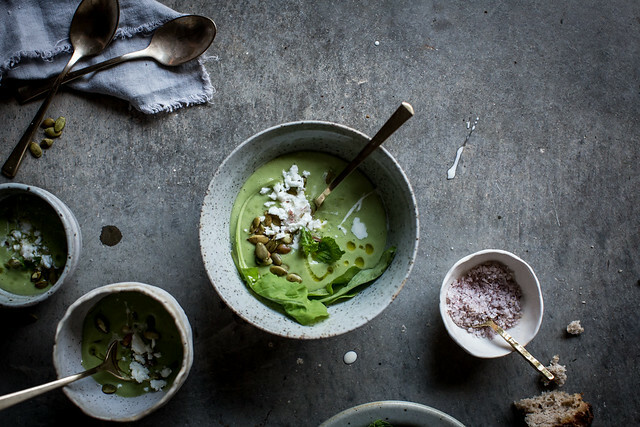 Soups are my favourite type of dishes and I can’t wait to try this out. Forget the soup! I like how you snuck HUSBAND in there several times. Congratulations on your marriage and many blessings! Agreed! Looks like she ran off and did this thing! I’m so glad someone mentioned this! How beautiful. I’m thrilled for you, Beth. Looks and sounds amazing! Can’t wait to make myself, beautiful photos. I just LOVE your photography style! looks delicious and your pictures are stunning!! 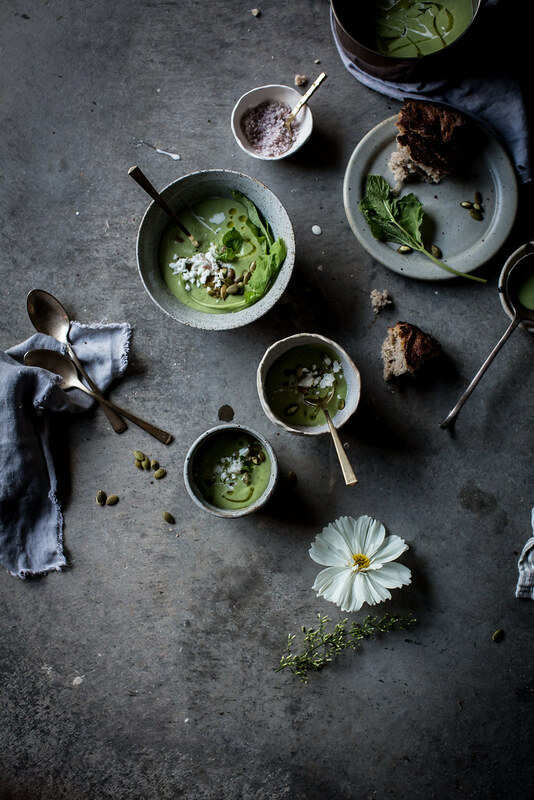 Oh I love avocados but have never thought about blending it into soup. I’m curious about how the texture would end up- if it would be velvety like avocados generally are or if it would be looser. 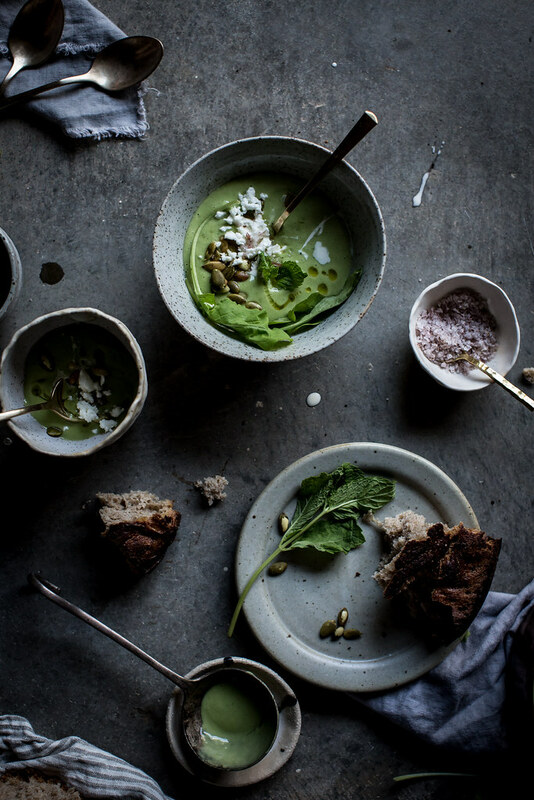 Either way, what a stunning soup- I wish I had everything to make it right now. I love your way with words…I almost feel like I am right there in the action! Funny thing is we just finished all the avocadoes from my parents’ tree. They can grow up to 1 foot by the way. Will definitely keep this recipe to make for the family. Soooooo GOOOOOOOD, amazingly simple and so easy to make! 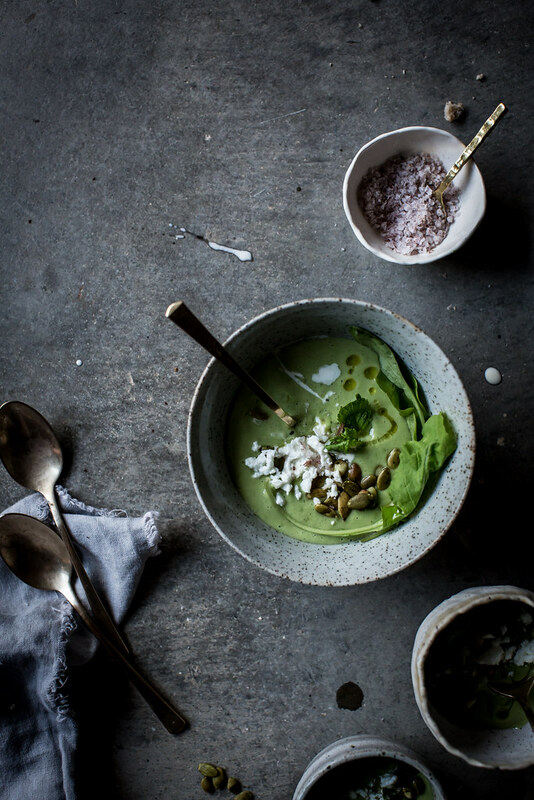 Oh, this look like the perfect soulful soup, just add a few croutons and it becomes the perfect healthy dinner. Have you tried this using old, call it, tangy arugula? I have: After the plant gets fair sized with hot weather, it turns very hot and bitter. But, I find if I saute it with, say, green beans, chopped green pepper, then adding only a little water, the arugula with friends does please the palate. Although I prefer my soup to be hot, this looks quite nice so I think I’ll try it out.